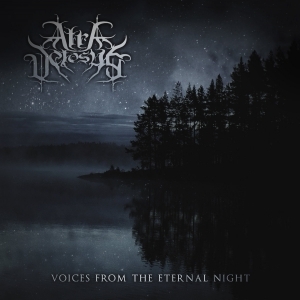 One of the many interesting bands on Belgium’s finest Immortal Frost Productions must be Atra Vetosus hailing from the Australian isle of Tasmania. This supreme Black Metal label from Flemish soil did release this band’s demo A Palace Shrouded In Emptiness, followed by two strong albums, Voices From The Eternal Night and Ius Vitae Necisque (the latter being a mini-album, actually). Both of them have been reviewed and published with self-satisfying pleasure by undersigned on September 9th 2014 and March 8th 2016 respectively. In the meantime, the band did independently release a live-album (which has recently been released in physical format too by Immortal Frost Productions! ), as well as a new full length, called Apricity, once again for the very same label, and in a very near future I will surely update a review on that new one. I can already promise one thing: it’s a killer-album once again! Just for your information, for what it’s worth. Original member Josh Young also is the guy behind Astral Winter, another great act on Immortal Frost Productions (reviewed quite positively too, so enter this band’s name, or the one from the label, to find out more), and this guy shares the project Hammerstorm with Immortal Frost Productions’ owner S. (the very same guy who is in, for example, Ars Veneficium). As said, purely informative, but extremely interesting to be aware of, to my (mostly important) opinion. Anyway, the debut full length Voices From The Eternal Night was initially released about five years ago, but it has been re-issued. It has now been remastered at the Wolfthrone Studio, located in the very South of Finland, and home to several bands / projects on Immortal Frost Productions’ roster. It comes with new artwork too, once again created by German artist Moornebheym, also deeply involved with the label. It would be very easy to refer to my initial review for this release – why not checking it, for it has some more info about the members involved and the original recording duties. But I wanted to start my listening sessions all over again, and have my review sort of virginal when it comes to the sonic side. The release brings dark, melancholic, melodic and atmospheric Black Metal with a lot of variety in structure and speed. The tempo is quite energetic for sure, with many fastened riffs, thundering drum patterns and fiery leads. It is not comparable to the devastating mardukian eruptions or limbonic artish outbursts, but rather inspired by the melodious scene from Scandinavia (though then again, they do not sound Swedish, Norwegian of Finnish in essence). In contrast, but totally organically presented, are some slower chapters, which are rather melancholic and dreamy, counterbalancing sweetly with the angrier excerpts. The whole is strongly guitar-oriented, with crafted, skilled leads and twin melodies, tremolo riffs and impressive solos. All this gets decently empowered by the heavy and pounding support of the rhythm section, which includes fine bass melodies, anti-static drum salvos and pushing walls of six-string elegance. But there is more: keyboards, acoustic and semi-acoustic guitars, and so on. The acoustic material acts as introduction or outro, then again as intermezzo (Into The Dawnless Night), yet sometimes as well as being part of the essence (example; the dual acoustic riffs at the end of A Palace Shrouded In Emptiness; listen carefully and you’ll understand what I’m saying). About the very same goes for the keyboard lines: supporting, adding or strengthening the atmosphere, then again taking the lead in an intro, or just adding an epic, glorious attitude. And then I did not mention the vocals yet. Josh’s throat sounds like rusty barbwire, hysterical yet not of the pathetic kind, but rather of a wretched acid-soaked grunt. A surplus is, besides the power from this voice, the easiness and differentiation, almost harmonious. And yes, there are some clean and spoken voices too, not being that expressive or surprising, yet simply fitting to the whole concept. The sound quality is more than okay. It is clean and decent, and maintaining an unpolished rawness in its execution. In shows it excellence throughout the whole album when dissecting the mix, for example. As said, the album is guitar-oriented especially, but it does not mean that you can’t notice the rhythm instrumentation or keyboard lines clearly. On the contrary; there is such fantastic equilibrium in between all different elements, like a culinary dish with different ingredients, representing their own flavour at the one hand, and emphasizing all other palates in a tasteful equilibrium. Bon appétit!